Deeper is out to bring amazing and memorable fishing experiences. It is an award-winning organization known for their sophisticated products known for innovation. Deeper brings their cutting-edge technology into the world of angling. Their Sonar Fish Finder is a game changer as it allows GPS bathymetric mapping as well as kayak, boat, and ice fishing capabilities. If you are not a pro, all you need is a smartphone, and you have much better chances than the pros who would care less about a fish finder. Agility is vital here, that’s why Deeper Smart Sonar Pro+ is castable. You can stand at the shore and see fish even before you catch them. 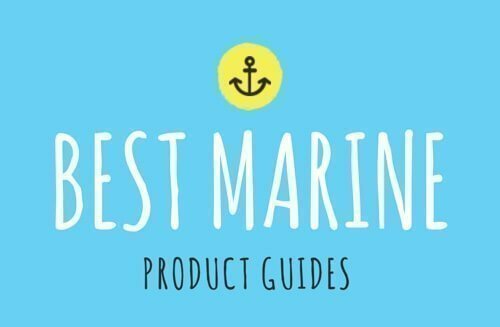 Deeper Smart Sonar Pro+: How good is it? Deeper Pro+ has without a doubt taken the world by storm. What seemed impossible like using a fish finder from shore is now possible. 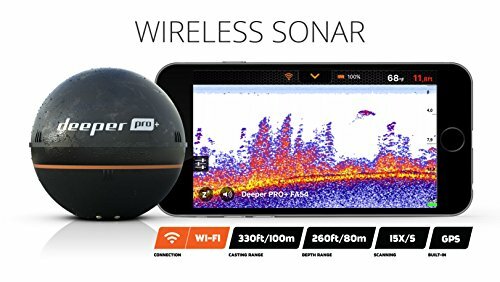 This fish finder pairs wirelessly via Wi-Fi with an Android 4.0+ or an iOS 9.0+ device. Once the Deeper Smart Sonar touches the water, it starts transmitting directly to your device. 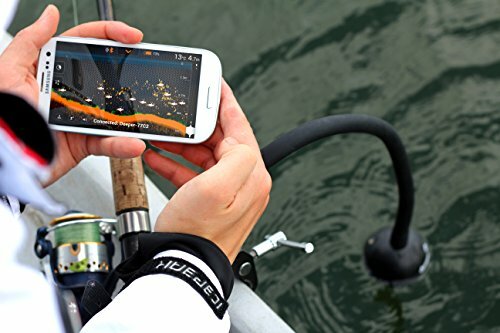 It transforms your tablet or smartphone into a smart sonar fish finder. You can see the vegetation, underwater structures, depth, temperature, and locations where the fish are hiding. If you are pro fisher, studying vegetation gives you a pretty good idea of where fish go to feed and the places they like to hide. Not to mention the capability of marking fish and seeing bait balls and fish arches as well as adding fish size icons and depth tags as you make more casts. The Deeper app allows live GPS split scanning and mapping. It helps you know your favorite locations so that you can see where you’ve been and your favorite fishing spots as well. Knowing the temperature and depth is essential in staying at your target depth range especially when trolling. The Deeper app also includes fish notes, weather forecast, and a Lunar Forecast calendar to help plan a fishing excursion. With GPS onshore mapping you can create a detailed map live on your smartphone screen for future use. 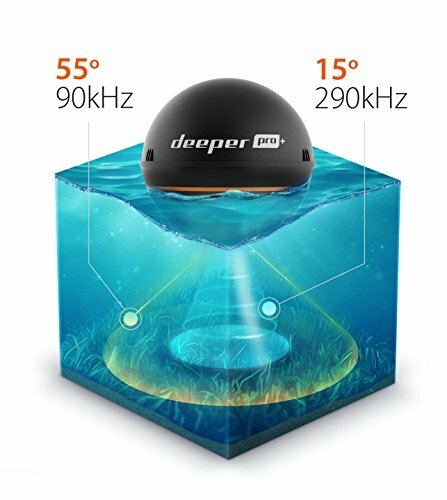 A unique aspect of the Deeper Smart Sonar Pro+ is that it emits its Wi-Fi field. This means it does not depend on cellular or internet data for connection. As long as your smart device and Deeper Sonar Pro+ have some juice, you can fish away from civilization and never miss out on the big fish. With a 330ft range, Deeper Pro+ can go even further. When cast you cast out the Deeper Pro+ can scan a depth of 260ft. Not to mention it can scan objects from as close as 2ft and can mark an object sized only 0.5inches at the maximum depth. This is a truly mobile fish finder weighing in only 3.5 ounces and 2.5inches in diameter. This device boasts a dual beam frequency using a wide beam (290kHz) that can see out to 55 degrees and a narrow beam (90kHz) that casts a 15-degree cone. Whether you want a small or big picture, the details of the image will be crisp clear. The Deeper Pro+ seems small, but this is a rugged device that can withstand impact thanks to its tough ABS construction. 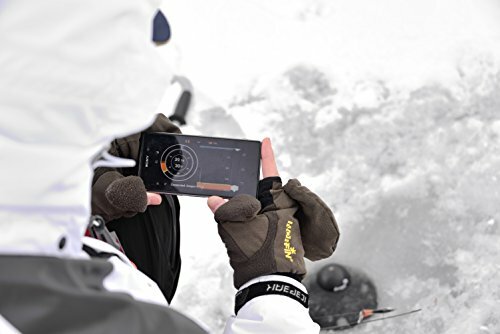 You have four fishing modes including standard, boat, Onshore GPS mode, and ice fishing. With the help of GPS, the Deeper Pro+ allows detailed bathymetric mapping from the shore. All the maps and scans are saved on the app so that you can access your history on your smartphone or a computer. It helps you to learn different fishing conditions and locations as well as the temperature and depth. This fish finder will install on your kayak with only clamping and unclamping. This way, you can use it with other vessels because no drilling is involved in the installation process. It uses a Deeper Arm Mount for kayak installation so that it remains flexible and versatile. In this mode, you can also create live GPS-powered maps. The Deeper Pro+ allows casting and trolling from a boat. This gives you a better range for scanning all the hard-to-reach areas. The Deeper Pro+ can detect fish even in ice. It is a fast way of knowing whether there’s fish in a particular area so that you do not need to drill before you know it’s the right spot. And if a certain spot has lots of fish, you can map it out and never waste time searching for it again. A rechargeable Lithium-Polymer 850mAh battery powers the Deeper Sonar Pro+. It arrives uncharged, so you have to charge it the first time you use it. It is supplied with a USB cable which you can connect to a computer port or your car’s power outlet. When GPS is not activated, the Deeper Sonar Pro+ has six hours of battery life when used in the 290kHz frequency. In the 90kHz frequency, you get 5½ hours or running time. With GPS the running time is reduced by 30 minutes on the 290kHz frequency and by one hour on the 90kHz frequency. This device transmits sonar information directly to your device. Like when you are scanning the area you want to fish, it will give you data to work with, and you can save in on your device to watch later. Deeper Smart Sonar Pro is designed to float on water. It is waterproof to a depth of one meter. In the submerged state, this device will record for five minutes and transmit the information when it resurfaces. What's the difference between Deeper Start vs. Deeper Pro vs. Deeper Pro+? Deeper Start is designed for shore anglers. It casts a powerful 40-degree sonar and has 130ft connection range over Wi-Fi. It can scan to a depth of 165ft. This fish finder sends scans automatically to the Deeper app. All the data is synced with a cloud server so that you can access it later. All your scans can be accessible from anywhere when you want to analyze your fishing history. The Deeper Pro is much like the Pro+ except it is not designed for onshore GPS mapping. It is much cheaper than the Pro+, and it has all the other incredible features of Deeper Pro+. The Deeper Smart Sonar Pro+ is the ultimate fish finder for shore anglers, kayakers, boaters, and ice fishers. It does not matter what the season is because it’s always a good time to catch some fish. It brings value in time and money because you will never waste a single minute trying to find fish since simply by casting into the water; you can see what is beneath the surface. Map your favorite spots and fish like a pro with Deeper Pro+.